2 players, with one ball per pair stand between two cones. Players face each other in the centre of an imaginary line between two cones 10 metres apart. On the coaches command "1-2-3 Quickfire", the players must perform a dragback or Cruijff turn and take the ball past the cone behind. If the player passes the cone before being tackled he/she wins a point. - Players should have happy feet (feet always moving). 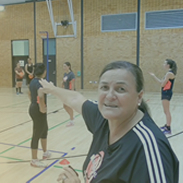 - Player should concentrate on quick feet and timing. - Accelerate away after turn.